This supplement provides documented cases of detained Bahai’s, Christians, students, journalists, and individuals facing stoning sentences, which served as the basis of Dr. Shaheed’s October 2012 report presented to the UNGA. The documentation is based on primary interviews and secondary research conducted for the October 2012 report. 1. Since the time of publication of the Special Rapporteur’s March 2012 report, institutionalized discrimination against members of the Bahá’í community, based on belief or religious affiliation, has continued, most notably with arbitrary arrests, interrogations, imprisonment, and excessive bail amounts. In addition, discrimination – often legally-sanctioned or governmentally-decreed – persists in the areas of education and employment. Sixteen new arrests from late March 2012 to June 2012 were noted in a report submitted to the Special Rapporteur by the Bahá’í International Community organization (see attached chart). 2. In one example of arbitrary arrest, interrogation, imprisonment, and excessive bail, on April 4, 2012, Mr. Houshmand Sanaie and his wife Mrs. Sholeh Sanaie, were arrested after their home had been searched by Intelligence officers who reportedly behaved violently. Mrs. Sanaie was purportedly interrogated and released after several hours, but was then re-arrested and imprisoned ten days later. Her husband was immediately detained and sent to prison. On 15 April, their son, Mr. Shayan Sanaie, 21, obeyed a summons to appear, and was allegedly interrogated and detained. He was released on bail two days later, after providing collateral for bail equivalent to 50 million tuman (±US$40,000). On 21 April, both of his parents were released on bail as well. 3. In March or April 2012, Mr. Danial Shahrizadeh was reportedly expelled from high school for refusing to participate in group prayer. According to the Bahá’í International Community, the school administration sent him to the security office of the Ministry of Education, where he and his parents were questioned for an extended period and repeatedly asked why Danial had become a Bahá’í. Danial’s parents are not Bahá’ís, but he has an aunt and uncles who are members of the community. He was sent to another school, where after having been informed of the reason for his expulsion, the principal and superintendent of the new school asked him not to make this matter known. 4. With regard to the crackdown on the Bahá’í Institute for Higher Education (BIHE) that began in May 2011, members of the community who have been interrogated during the past year about the BIHE have reportedly been subjected to harsh treatment during questioning. Moreover, all those linked to the work of the Institute have been threatened with imprisonment, parents who hosted classes were warned that their homes would be expropriated if the classes continued, and students were not only ordered to stop taking BIHE courses, but also told that they will never be granted access to higher education in Iran as long as they do not abandon their faith and declare themselves to be Muslims. It is still official policy to expel students when it becomes clear that they are members of the Bahá’í community. It is not known how many more students were expelled on religious grounds in recent months. 5. Following a 2007 directive promulgated by the Public Places Supervision Office to drive Bahá’í out of the 25 trades from which they had been banned, many Bahá’ís’ professional licenses were revoked and stores and businesses closed. In late 2008, the city of Semnan’s Chamber of Commerce and 39 member trade unions decided to stop issuing business licenses and managerial permits to Bahá’í and to cease renewing licenses held by any of them. Some valid business licenses and permits were even revoked and confiscated, and at least 15 Bahá’í-owned shops and manufacturing businesses in the city have since been closed. On May 28, 2012, Intelligence Ministry agents raided and sealed premises in Semnan that were fully or partially owned by adherents of the Bahá’í Faith: the Puya Navar factory, which produced vertical blinds and had 51 employees, 15 Bahá’ís and 36 non-Bahá’ís; and a lens grinding factory that had eight employees, two Bahá’ís and six non-Bahá’ís. 6. There has been no change in the status of the seven Bahá’í leaders and members of the “Yaran” group, which, according to the Bahá’í World News Service, “tend[ed] to the spiritual and social needs of the 300,000-member Baha’i community of [Iran].” Mrs. Fariba Kamalabadi, Mr. Jamaloddin Khanjani, Mr. Afif Naeimi, Mr. Saeid Rezaie, Mrs. Mahvash Sabet, Mr. Behrouz Tavakkoli, and Mr. Vahid Tizfahm were all arrested in May 2008 – with the exception of Ms. Sabet, who was arrested in March of that year. The two women are incarcerated at Evin prison in Teheran and the five men in Gohardasht Prison in Karaj. One of the prisoners was recently granted a short temporary leave. 7. As part of a wave of arrests targeting members of the Bahá’í community in Shiraz which began early in 2012, at least three more individuals have been detained since the time of last reporting; Mr. Sarir Sadeghi, Mr. Kambiz Habibi, and Mr. Kavous Samimi. On March 20, 2012, all of the individuals arbitrarily detained in this context at the interrogation center of the Intelligence Ministry in Shiraz were transferred to the Adelabad facility, a public prison. Three of them were released on April 24, 2012, after posing collateral for bail equivalent to 100 million tuman (±US$80,000). Six more were released on bail on April 29, 2012. The rest remain arbitrarily detained. 8. In addition to eight Bahá’ís arrested in Mashhad in February 2012 during or shortly after a charity handicraft exhibition for children and young adolescents, an additional person, Ms. Negar Malekzadeh, was arrested on April 2, 2012 for allegedly co-organizing the event. Within 30 minutes of the opening of the aforementioned event, which was held in the parking lot of a residence belonging to one of the Bahá’ís, five officals from the Intelligence Ministry interrupted the event, demanded the mobile phones of all present, separated the men from the women and, while videotaping them, had them introduce themselves by name, family name, father’s name, and religion. Each participant was given a paper to enter their personal information and told that they would be summoned to appear in court. After a large number had gathered in the parking lot, Muslims were separated from Bahá’ís, taken to one side and instructed to explain their connection to the Bahá’í and their presence at this event. After being questioned, the Muslims were told to leave, and only Bahá’ís remained with the officials. At the time scheduled for the exhibit to end, the officials called out the names of the individuals they subsequently arrested and ordered the others to go home. On March 15, 2012, Ms. Behnaz Haddadzadeh and Ms. Fattaneh Hajipour were released after posting collateral for bail. And on March 25, 2012, Mr. Ahmadian, Ms. Khalili, and Mr. Mokhtari were also released after posting collateral for bail equivalent to 100 million tumans (±US$80,000). Two other members of the Bahá’í community in Mashhad are currently free pending trials, and four others have been sentenced and convicted to one-and-a-half years in prison (see attached chart). 9. In Kerman, a Bahá’í couple was arbitrarily detained in an Intelligence Ministry detention center for over five months, beginning in January 2012. Fifty-four-year-old Mrs. Farahnaz Naeimi (Rasekhi), the imprisoned wife, is seriously ill, but the authorities have not responded to her family’s requests to have her taken to a clinic or hospital. Her husband, Mr. Bakhtiyar Rasekhi, had been in solitary confinement for 70 days as of March 14, 2012. When his relatives protested, the only response given was that the period of his “temporary detention” had been extended for an undefined period of time. 10. Since the period of information-gathering for Special Rapporteurs’ last report, some Bahá’ís in Mashhad have been released, including Mr. Erfan Shojaie, Mr. Natoli Derakhshan, Ms. Raha Sabet, and Ms. Maryam Akhzari (Mr. Shahnam Golshani, for whom Ms. Akhzari worked as a secretary, remains imprisoned). Mr. Shojaie was required to post an excessive collateral equivalent of 200 million tuman (±US$160,000) for bail. To the knowledge of the Bahá’í International Community, five other members are free pending appeal or the issuing of their sentences: Mrs. Zohreh Nikayin; Mrs. Elham Ruzbehi; Ms. Anisa Fanaiyan; Mr. Pooya Tebyanian, Mr. Ali (Cheraghali) Ahmadi; and Ms. Mahsa Mehregani. 11. Despite a 2002 moratorium on stoning declared by the Iranian Head of the Judiciary, the sentence continues to be handed out for a wide variety of convictions, and remains technically mandatory for cases of “adultery while married.” Stoning is widely recognized as a form of torture, a violation of the International Covenant on Civil and Political Rights (ICCPR), and a violation of the international prohibition on cruel, inhuman, or degrading treatment or punishment. While the new Iranian Penal Code appears to omit reference to stoning, judges are still required to pass sentences in accordance with their understanding of Islamic law, thereby potentially nullifying any apparent shift in policy. Moreover, in January 2009, the Spokesperson for the Judiciary stated that the 2002 directive to judges on the moratorium had no legal weight and that it could be ignored. 12. Ten of the 15 individuals listed as “believed to be at risk of death by stoning” in Amnesty International’s 2010 Report: Iran: Executions by Stoning, appear to remain at risk of this punishment. Two of the individuals, Mr. Rahim Mohammadi and someone identified only as M. Kh.,” appear to have been executed by hanging instead of stoning. The sentences of another two people, Mrs. Maryam Ghorbanzadeh and Mrs. Sakineh Mohammadi Ashtiani, were converted from stoning to hanging but appear to not yet have been carried out. The sentence of Mrs. Azer Bageri, who was a minor when sentenced, appears to have been changed to flogging. 14. In the case of Mr. Iran Eskandari, according to reports, she was talking to the son of a neighbor on her property when her husband attacked her with a knife, leaving her bleeding and unconscious on the floor. While she was unconscious, the neighbor’s son allegedly killed her husband. When police interrogated her, she reportedly admitted to adultery with her neighbor’s son, but she later retracted this “confession.” In June 2007 the Discernment Branch of the Supreme Court overturned the stoning sentence and sent her case back for retrial before a criminal court in Khuzestan, where that sentence was re-imposed. 15. Ashraf Kalhori (or Kalhor), around age 40 and a mother of four, was sentenced to death by stoning for adultery and to 15-years’ imprisonment for taking part in the murder of her husband in April 2002. Her prior request to divorce him had been rejected by a judge. She claimed that the killing was accidental, but police accused her of having an affair with a neighbor and encouraging the attack. She was reported to have “confessed” to adultery under police interrogation, but later retracted her statement. She was scheduled to be stoned before the end of July 2006, but her execution was temporarily stayed. On July 23, 2009, it was reported that the Amnesty and Clemency Commission had rejected her plea. 16. Despite the de jure equality that Iran’s Christians supposedly enjoy in the areas of religious recognition and practice, as enshrined in articles, 13, 14, and 26 of the Iranian Constitution and elsewhere, Sharia Law – which is also recognized as the law of the land – has been used to target Christian individuals and communities. Sources have reported that at least 300 Christians have been arbitrarily arrested and detained throughout the country since June 2010. Moreover, the Intelligence Ministry purportedly closely monitors Protestant congregations. Reports communicate that Intelligence officials routinely summon or detain members of Protestant groups for interrogations, during which individuals are questioned about their beliefs, church activities, other church members, and are often urged to return to Islam. Some Protestant’s report being threatened by Intelligence officials with arrest and apostasy charges if they do not return to Islam. This pattern of harassment has resulted in most Protestant churches operating underground, holding church services and bible studies in private homes, called house-churches. House-church groups, if discovered, are often ordered to suspend their various meetings and are told that their meetings were illegal without permits. At least one church group, the Church of Iran, reports that they tried unsuccessfully to obtain a license from the authorities in the northern city of Rasht to become an officially-recognized religious organization and to be permitted to establish a formal Church in a public building. 17. Mehrdad Sajjadi, a member of the Board of Trustees of the Immanuel Presbyterian church in Tehran, was arrested along with his wife, Forough Dashtianipour, in late May 2012. The couple was reportedly arrested in their house in Golshahr in Karaj by plainclothes Iranian security forces in the late hours of Thursday May 24, 2012, or the early hours of Friday, May 25, 2012, and transferred to an undisclosed location. According to eyewitnesses, neighbors believed the entry to be the act of thieves and dialed the National Police (or “Police 110” – Iran’s version of emergency services). When the National Police arrived on the scene, they informed the neighbors of Sajjadi that the plainclothes intruders were in fact Intelligence forces. These forces searched Mehrdad Sajjadi’s house for roughly four hours in total – they confiscated some of the personal belongings in the Sajjadi household and eventually transferred Sajjadi, along with his wife, to an undisclosed location. Since their arrest, their families have been unable to obtain any information from the authorities regarding their locations or the charges against the couple. It has since been confirmed that Forough Dashtiani was temporarily released from custody on bail on Thursday, June 7. 18. Pastor Youcef Nadarkhani, who converted to Christianity at age 19, and whose apostasy conviction was consecutively upheld in 2010 by a Criminal Court of Appeals and in 2011 by the Supreme Court via a directive to the lower court, remains incarcerated and faces the death penalty if he does not recant his faith. Apostasy, the act of renouncing one’s religion, is not a crime under Iran’s current written Islamic Penal Code. Instead, the presiding judges in Nadarkhani’s cases rested their opinion on texts by Shia religious scholars. Fellow Pastor Behrouz Sadegh-Khanjani (of the Church of Iran in the city of Shiraz), who was arrested in June 2010 and reportedly held for incommunicado in solitary confinement for approximately two months, had his original apostasy conviction changed to blasphemy. He was sentenced to one year in prison on April 5, 2011, and is currently free on bail. 19. Hamed Pishkar and Reza (Davoud) Nejatsabet are Protestant Christians from city of Rasht and members of the Church of Iran. On numerous occasions, Ministry of Intelligence officials summoned or detained each for questioning. Pishakar was finally arrested in January 2010, and Nejatsabet in August 2010. They were both convicted, in separate trials, of “propaganda against the Islamic Republic of Iran” through holding gatherings with the alleged intent of converting Muslims to Christianly. Both fled to Turkey in 2010 while freed on bail and awaiting appeal. 20. There are at least 31 student prisoners of conscience in Iran – including some recently sentenced (see attached chart) – being held on charges ranging from the spurious “putting up posters” to attending an anti-government rally. Some of those imprisoned were handed the additional sentence of “prison in exile,” and sent to distant rural prisons without the right to family visitation. 21. Majid Tavakoli, who was sentenced to seven-and-a-half years after he spoke at a university rally in 2009, remains incarcerated. Tavakoli charges included “participating in an illegal gathering,” “propaganda against the system,” and “insulting officials.” From January until May 2010 he was held mostly in solitary confinement at Evin prison in Tehran. In August 2010, authorities transferred him to Raja’i Shahr prison, where violent criminals are housed. Tavakoli is said to have a respiratory disease, which has reportedly worsened after a hunger strike and because of poor prison conditions. After Majid’s initial arrest, a state-run Iranian newspaper published a photograph of Majid wearing a hijab (a woman’s Islamic headscarf), claiming that he had dressed as a woman in an attempt to evade arrest. However, eyewitnesses have countered that Majid was forced to wear the hijab by security forces in an attempt to shame him. 23. Arbitrary arrests and detention of reporters and netizens continued in recent months. Most arrests were related to alleged political activity, “criticizing the regime,” or “disturbing public order,” but some were detained on apparently unrelated trumped-up charges. 24. June 2012: On 30 June 2012, Reporters Without Borders reported the arrest of Mohammad Solimaninya, head of the social networking site u24, after he was summoned to Tehran’s Evin prison. The netizen had been previously arrested on 10 January 2012 and released on bail. On 9 June 2012, lawyer Farideh Gheirat was informed that his client, the feminist journalist Noushin Ahmadi Khorasani, had been handed a one-year suspended prison sentence by the 26th chamber of the Tehran revolutionary court. She is the founder of The Feminist School website and co-organizer of the “One Million Signatures for Equality” campaign calling for the reform of laws that discriminate against women. The journalist Bahman Ahamadi Amoee, who had been held in Evin prison since 20 June 2009, was transferred on 12 June to Rajai Shahr jail in the northern town of Karaj, where violent criminals are housed, after he took part in a ceremony organized by prisoners in an Evin prison dormitory in memory of the journalist and writer Hoda Saber, who died on 12 June after a hunger strike. 25. May 2012: Reporters Without Borders reported that Sam Mahmoudi Sarabi, a journalist with the newspaper Shargh, was re-arrested on 28 May 2012 because the person guaranteeing his bail of 150 million tomans (approximately US$12,200) refused to continue acting as guarantor. This was Sarabi’s third arrest. On 6 May 2012, two journalists from the website of the Beheshti Foundation, Meisam Mohammadi and Omid Mohadess, were each sentenced to four years’ imprisonment and banned from working in journalism and engaging in political activity for five years. They were arrested at their homes by plainclothes police in February 2010. 27. Recently-Released Journalists: Ehssan Hoshmand, a journalist and sociologist who specializes in the history of the Kurdish people, was released on bail on 23 April. He was arrested at his home on 7 January. Reza Taleshaian Jolodarzadeh, the editor of the weekly Sobeh Azadi, was freed on 17 April after being held for two-and-a-half months. He suffers from a chronic illness resulting from an injury sustained during the 1980-88 Iran-Iraq war. The Ministry of Culture and Islamic Guidance suspended his newspaper on 19 October 2011 after it ran a photo of former President Akbar Hashemi Rafsanjani. Blogger and human rights activist Kouhyar Goudarzi, who kept a blog called Kouhyar, was released on bail on 12 April, but in May, a Tehran revolutionary court sentenced Goudarzi to five years in jail and internal exile: he is supposed to serve his time in prison in the northeastern city of Zahedan. On 2 August 2011, Goudarzi’s mother, Parvin Mokhtare, was arrested at her home in the eastern city of Kerman and was sentenced by a Kerman revolutionary court to 23 months in prison. She was freed on 19 March. On 10 March, Rahim Sarkar, editor of the weekly Hadiss Qazvin, was freed after payment of bond. He was arrested on 8 March after being summoned to the revolutionary court in the city of Qazvin. He had been charged on 27 February with “publishing false information with the aim of disturbing public opinion.” According to the prosecution, “The newspaper published in its latest edition, images of prisons, poverty, executions, etc. in order to paint a bleak picture of the country. The accompanying article forecast a poor turnout at the parliamentary election on 12 March.” In late February 2012, Parastoo Dokoohaki, a blogger and women’s rights activist, Sahamoldin Borghani, a journalist who writes for the news website Irdiplomacy, and Marzieh Rasouli, who contributes to the arts and culture sections of several newspapers, were released on bail. They were originally arrested on 15 and 18 January and held in solitary confinement in Sections 209 and 2A of Tehran’s Evin prison, which are run by the Intelligence Ministry and the Revolutionary Guards. The three were part of a January 2012 sweep of journalists accused of collaborating with, gathering information for, and producing content for the BBC. 1 year’s imprisonment and 4 years internal exile (reduced to 1) to Damghan. Ordered to go to Bijar. Remaining internal exile commuted to additional 6 months’ imprisonment in Sari. As of August 2010, her sentence had been changed from stoning to hanging, and she was forced to have an abortion at six months in order to be executed. No further information on whether or not that execution was carried out. By January 2011, her stoning sentence was suspended, and she remains alive in prison, although a month before the sentence change Iranian authorities committed to executing her by hanging in lieu of stoning. No further information on whether or not that execution was carried out. An appeals court changed her sentence to flogging, but since she is now of age to be stoned according to Iranian law, her lawyer still worries that stoning may await stoning. In 2007, an appeals court re-imposed the stoning sentence that the Supreme Court had overturned. No public updates as to whether or not her stoning sentence has been carried out. No public updates on whether or not her 2006 stoning sentence has been carried out. No public updates on whether or not her 2009 stoning re-sentencing has been carried out. No public updates on whether or not her 2008 stoning sentencing has been carried out. Was executed in October 2010 by hanging. No public updates since Amnesty’s 2010 report on his sentencing. December 2006 charged with “national security crimes.” Found guilty on 23-Feb-08. This verdict recommended the prosecutor pursue a death sentence for apostasy. Serving sentence; in poor health and not receiving proper medical treatment. Handed a 1-year sentence in January 2011. After serving almost the entire year, he was told must also serve 5 years from previous 2008 suspended sentence. Actions against national security and propaganda against the regime. He was accused of holding church meetings in order to perform crimes against national security, distributing Bibles amongst youth, and communicating with Zionist satellite channels. Crimes against national security; sentenced to 6 years in prison and 90 lashes and a fine on 19-Nov-11. “Actions against national security,” “being in contact with enemy foreign countries,” and “religious propaganda”; part of the evidence offered at the trial was possesion Farsi-language Bibles and Christian literature. June 2012 appear was unsuccessful. Fathi’s family could not afford to pay the bail amount requested, and the offer for bail was subsequently withdrawn. Fathi was detained without an indictment for 16 months, and kept in solitary confinement for most of that time. Fathi’s lawyer was also deprived of full access to his client’s case. Membership in illegal group (house-church) and apostasy (later dropped). Serving sentence; Maryam Jalili was among 15 Christians arrested by security forces in Pakdasht when they gathered at a house church to celebrate Christmas on 24-Dec-09, and secretly transferred to Evin prison for a time. Serving sentence; was temporarily released on 9-Jul-11after 114 days in prison, on US$100K bail, but was arrested 2 weeks later to serve sentence. Was denied full access to legal counsel. Was arrested with 9 other converts during a house-church raid. . Banned from pursuing education for 1 year. Released from prison on 30-Nov-11. Being a Christian student activist of Azad University. No formal charges, but some authorities announced the charges as attending house-church services, promoting Christianity, propagating against the regime, and disturbing national security. Mrs. Dashtianipour was arrested along with her husband, Mr. Mehrdad Sajjadi, in May 2012, after a search of the couple’s home in May 2012. She was released on bail on 7 June 2012. Authorities detained, Behrouz Sadegh-Khanjani, pastor for the Church of Iran in the city of Shiraz, in June 2010 and reportedly held him for approximate 2 month incommunicado in solitary confinement and then transferred to standard detention. Authorities originally charged him with apostasy, but later dropped and instead charged him with “blasphemy.” He is awaiting trial under this charge. On 5 April 2011, the First Branch of the Revolutionary Court in the city of Shiraz sentenced Pastor Behrouz Sadegh-Khanjani with a year in prison for “propaganda against the regime.” Authorities, however, acquitted him on the count of “acting against national security.” He is currently free on bail. On 5 April 2011, the First Branch of the Revolutionary Court in the city of Shiraz sentenced Mr. Parviz Khalaj , a co-member of the Church of Iran with Pastor Sadegh-Khanjani, with a year in prison for “propaganda against the regime.” Authorities, however, acquitted him on the count of “acting against national security.” He is currently free on bail. On 5 April 2011, the First Branch of the Revolutionary Court in the city of Shiraz sentenced Mr. Amin Afshar Manesh Khalaj, a co-member of the Church of Iran with Pastor Sadegh-Khanjani, with a year in prison for “propaganda against the regime.” Authorities, however, acquitted him on the count of “acting against national security.” He is currently free on bail. On 5 April 2011, the First Branch of the Revolutionary Court in the city of Shiraz sentenced Mr. Mehdi Forutan, Khalaj , a co-member of the Church of Iran with Pastor Sadegh-Khanjani, with a year in prison for “propaganda against the regime.” Authorities, however, acquitted him on the count of “acting against national security.” He is currently free on bail. On 5 April 2011, the First Branch of the Revolutionary Court in the city of Shiraz sentenced Mr. Mohammad Baliad Khalaj, a co-member of the Church of Iran with Pastor Sadegh-Khanjani, with a year in prison for “propaganda against the regime.” Authorities, however, acquitted him on the count of “acting against national security.” He is currently free on bail. On 5 April 2011, the First Branch of the Revolutionary Court in the city of Shiraz sentenced Mr. Nazli Makarian Khalaj, a co-member of the Church of Iran with Pastor Sadegh-Khanjani, with a year in prison for “propaganda against the regime.” Authorities, however, acquitted him on the count of “acting against national security.” He is currently free on bail. After numerous questionings by the Ministry of Intelligence, Mr. Pishkar was finally arrested in January 2010. On 26 October 2010, the first Branch of the Revolutionary Court for the Gilan province in Rasht sentenced Pishkar to one year in prison on the charge of “propaganda against the Islamic Republic of Iran” through holding gatherings in his home with the purpose of converting Muslims to Christianity. The Judge also recommended in the opinion that the prosecutor should also pursue an apostasy charge against Pishkar. Shortly after his sentence, while out on bail awaiting appeal, Pishkar fled to Turkey. After numerous questionings by the Ministry of Intelligence, on 13 August 2010 the first Branch of the Revolutionary Court for the Gilan province in Rasht sentenced Nejatsabetto a 5-year suspended prison term on the charge of “propaganda against the Islamic Republic of Iran” through holding gatherings with the purpose of converting Muslims to Christianity and by distributing anti-Islamic materials (i.e. CDs and books with Christian content). Shortly after his sentence, while out on bail awaiting appeal, Nejatsabet fled to Turkey. Detained; charges not made public. He was arrested along with 10 other converts at a Christmas party. His release was announced on 16-Jul-12. Head of the social networking site u24, Solimaniya was arrested after he was summoned to Tehran’s Evin prison.The netizen had been previously arrested on 10 January this year then released on bail on 22 May on payment of a bond. Lawyer Farideh Gheirat was informed that his client, the feminist journalist Noushin Ahmadi Khorasani, had been handed a one-year suspended prison sentence by the 26th chamber of the Tehran revolutionary court. She is the founder of the Feminist School website and co-organizer of the “One Million Signatures for Equality” campaign calling for the reform of laws that discriminate against women. 20-Jun-09; transferred to violent criminal facility on 12-Jun12. The journalist Bahman Ahamadi Amoee, who had been held in Evin prison since 20 June 2009, was transferred on 12 June to Rajai Shahr jail in the northern town of Karaj after he took part in a ceremony organized by prisoners in an Evin prison dormitory in memory of the journalist and writer Hoda Saber, who died on 12 June after a hunger strike. 28-May-12; 9-Jan-11; a third prior arrest. Sam Mahmoudi Sarabi, a journalist with the newspaper Shargh, was re-arrested on 28 May 2012 because the person guaranteeing his bail of 150 million tumans refused to continue acting as guarantor. He was Arrested on 9 January 2011 for the second time in less than two years, and spent five months in prison before being released on bail on 9 May 2011, pending trial. Meisam Mohammadi was sentenced to four years’ imprisonment on 6 May 2012, and banned from working in journalism and engaging in political activity for five years. He was previously arrested at his home by plainclothes police in February 2010 and released on bail after two months, pending trial. A journalist with the newspaper Shargh and the now-closed newspaper Etemad Melli, was arrested on 3 April 2012 in order to serve a six-month jail sentence on a charge of anti-government propaganda. Another Shargh journalist, Tabatabai was notified on 2 April 2012 that a Tehran revolutionary court had sentenced her to a year in prison. Originally arrested at her home by Intelligence Ministry officials on 12 December 2010, she was freed on 16 January 2011 on bail. Tahmineh Monzavi was arrested by officials of the Intelligence Ministry at her workplace on 19 February 2012. Her family does not know the reasons for her arrest or where she is being held. The Tehran revolutionary court sentenced Mehdi Khazali, editor of the Baran blog, to 14 years’ imprisonment, 10 years’ internal exile in the southwestern city of Borazjan, and 70 lashes. He was arrested on 9 January 2012 for the third time in less than two years. Khazali is the son of Ayatollah Abolghasem Khazali, an influential member of the Council of Guardians of the Iranian Constitution for the past three decades. Khazali has been very critical of the government’s policies and human rights violations on his blog, which has been hacked and is no longer accessible. Said Razavi Faghih, a journalist and former student leader who has worked for several reformist newspapers, was detained at Tehran airport on 22 January after arriving in the country from France where he had lived since 2004. He was studying philosophy in Paris. Iran’s police responsible for Internet security announced the arrest of two men and two women accused of creating a network aimed at corrupting Iranian youth by “promoting prostitution and immorality.” The cyber police have taken control of the Facebook page “Daf & Paf” which the group is alleged to have set up. The page, which has nearly 27,000 members, encouraged male and female participants to take part in an online beauty contest by submitting photographs of themselves. Peyman Pakmehr, the editor of the Tabriz News website, was arrested by local Intelligence Ministry officials in the northwestern city of Tabriz on 17 January 2012 on the orders of prosecutors in Tehran, and was transferred to Tehran’s Evin prison. The reason for his arrest is still not known. Nazanin Khosravani, a political columnist for several now-banned reformist newspapers, was summoned to Tehran’s Evin Prison in early March to serve the six-year prison term she was handed in February 2011 on charges of “assembly and collusion against national security” and “propagating against the regime.” Khosravani was arrested in November 2010 and spent 132 days in prison with much of her time in solitary confinement. A freelance journalist who has worked for reformist newspapers, Rad was summoned on 3 May 2012 to serve a one-year term in Evin Prison, according to Iran’s Committee of Human Rights Reporters, a leading organization of journalists who document human rights abuses. In September 2011, a Tehran Revolutionary Court sentenced him to prison for “propagating against the regime,” news reports said. Rad is in poor physical condition and has suffered two seizures while in perison. When he appeared at the court on 3 May, he was arrested and transferred to Evin Prison, where he is currently inside Ward 350. Amrabadi worked for reformist publications including Etemad-e Melli; was summoned to Evin Prison on 9 May 2012 to serve a one-year prison sentence, according to reformist news websites. A Tehran Revolutionary Court had sentenced her in late February to a year in prison and a four-year suspended term on charges of “assembly and collusion against national security,” according to news reports. Her husband, the imprisoned journalist Massoud Bastani, is serving a six-year prison term at Rajaee Shahr Prison..
Fatemeh Kheradman and Ehsan Houshmandzadeh (below) were arrested by plainclothes men at their Tehran homes on 7 January 2012. Confirming their arrest the next day, Intelligence Minister Heydar Moslehi said they had “envisaged carrying out American plans to disrupt the parliamentary elections by using cyber-space and social networks.” Was released on bail in January. A journalist who reports on social issues, Houshmandzadeh is a National-Religious activist and an ethnic issues researcher. On 7 January 2012 authorities arrested him and transferred him to Evin Prison. He was held in solitary confinement but was transferred to a cell with two prisoners in Security Ward 209. Was released on bail in April. A contributor to the website Majzooban, Nematollahi was arrested on 7 January 2012 at her Tehran home by officials of the Intelligence Ministry on a charge of anti-government propaganda. Was released on bail in February. Mehdi Khazali was violently arrested for the fourth time on 9 January 2012 and was taken to Evin prison. During the arrest he suffered broken teeth and a broken arm. He once again launched a hunger strike from the start of his incarceration. On 1 February 2012, while his arm was broken and he had lost a lot of weight, Khazali was transferred to Ward 350 in Evin prison. Khazali who edits the Baran blog and has been arrested several times in the past. Khazali is the son of Ayatollah Abolghasem Khazali, an influential member of the Council of Guardians of the Iranian Constitution for the past three decades. Despite his frequent run-ins with the authorities, Mehdi Khazali is very critical about the government’s policies and human rights violations in his blog, which has been the victim of a cyber-attack and is no longer accessible. Was released on bail in March, after his health deteriorated following a hunger strike. Ali Mousavi Khalkhali was picked up by security officials in January. He is reported to have been arrested on charges related to propaganda against the regime. Mousavi Khalkhali worked for the Irdiplomacy news website and is a nephew of Ayatollah Hakim, a senior Shiite cleric of Iranian origin in Iraq. Was released on bail in March. Journalist, blogger, and women’s issues researcher, Dokouhaki was arrested on 15 January 2012 .She was reportedly formally charged with “propaganda against the State.” In the past three years, she haf not been involved in political or journalistic activities and her activities were limited to working with the Shariati Foundation as an editor and translator. Dokouhaki, who is in her early thirties, writes about women’s and social issues. She has worked for the now-banned women’s issues monthly Zanaan and other reformist newspapers such as Yas-e No, Vagha-ye Etefaghiyeh, Norooz, Hambastegi, and Etemaad-e Melli. Was released in February. According to reports, security agents arrested Rasouli after searching her home and seizing her personal property. Security agents presented Rasouli with an arrest order in which the charge against her was stated as “acting against national security.” Security agents told the family that they were transferring Ms. Rasouli to Evin prison. Ms. Rasouli is a journalist that covers music and publishing and has worked for reformist dailies such as Shargh and Etemad. Was released in February. Security forces arrested Tahmineh Monzavi, an award-winning freelance photographer, at her workplace in Tehran on February 19, and searched her home, reformist news websites said. The journalist has documented sensitive social issues in the country, like homelessness and drug addiction. Authorities did not disclose her whereabouts, legal status, or health condition. Was released in April. Sarkar was arrested on 8 March after being summoned to the revolutionary court in the city of Qazvin. He had been charged on 27 February with “publishing false information with the aim of disturbing public opinion.” Was released on bail in March. A Tehran Revolutionary Court sentenced Reyhaneh Tabatabaie, a journalist for the reformist newspaper Shargh, to a one-year prison term on 2 April 2012 for alleged “propaganda against the state” and “weakening the pillars of the Islamic Republic,” according to a reformist news website. The court’s verdict said her offenses included reporting on the arrest of political prisoners after the 2009 presidential election. Tabatabaie was arrested in December 2010 and released on bail a month later. She has not been summoned to serve her sentence yet. Ehssan Hoshmand is a journalist and sociologist who specialized in the history of the Kurdish people. Was released on bail in April. Reza Taleshaian Jolodarzadeh, the editor of the weekly Sobeh Azadi, was freed on 17 April 2012 after being held for two-and-a-half months. He suffers from a chronic illness resulting from an injury sustained during the 1980-88 Iran-Iraq war. The Ministry of Culture and Islamic Guidance suspended his newspaper on 19 October 2011 after it ran a photo of former President Akbar Hashemi Rafsanjani. The blogger and human rights activist Kouhyar Goudarzi, who maintained a blog called Kouhyar, was arrested on 1 August 2011 in Tehran. He spent several months in Evin prison without the authorities saying where he was being held. He was sentenced to five years in jail and internal exile, but was released on bail in April 2012. Parastoo Dokoohaki, a blogger and women’s rights activist, Sahamoldin Borghani, a journalist who writes for the news website Irdiplomacy, and Marzieh Rasouli, who contributes to the arts and culture sections of several newspapers were arrested on 15 and 18 January 2012 and held in solitary confinement in Sections 209 and 2A of Tehran’s Evin prison, which are run by the Intelligence Ministry and the Revolutionary Guards. The journalists were freed after the payment of bond. The day before their release, the organized crime unit of the Revolutionary Guards, in a statement on the website Gerdab.ir, accused them of collaborating with the BBC, British intelligence, and the foreign-based opposition. The Revolutionary Guards announced that an operation code-named “eye of the fox” had led to the break-up of a network that gathered information and produced content for the BBC in Iran. The British broadcaster denied it employed staff in Iran. In the past, satellite stations such as the BBC and Voice of America have been jammed at regular intervals. Documentary filmmaker; released in January. Fatemeh Khardmand is a journalist for the monthly Gozaresh Sanat Chap. Was released in February. 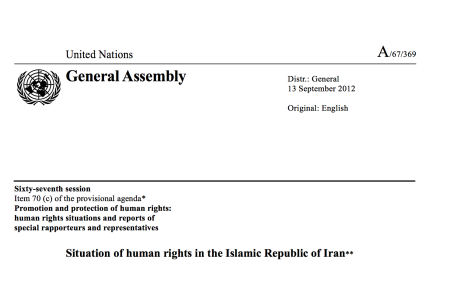 Human rights violations against the Bahá’ís in the Islamic Republic of Iran (June 2012), Bahá’í International Community report, submitted to the Special Rapporteur in June 2012. Iran: Executions by Stoning. Amnesty International, December 2010. “Speak Out for Imprisoned Students in Iran,” International Campaign for Human Rights in Iran, 26 April 2012 (available at: http://www.iranhumanrights.org/2012/04/imprisoned-students-campaign/). All information presented in paras 22-26 is based on or taken from a report submitted by Reporters Without Borders to the Special Rapporteur in July 2012. Information from: Human rights violations against the Bahá’ís in the Islamic Republic of Iran (June 2012), Bahá’í International Community report (annex), submitted to the Special Rapporteur in June 2012. Sources have reported more than 300 arbitrary arrests of Christians throughout the country since June 2010. The following tables, 3 and 3.a, contain only some cases, for which some details are known. The information is drawn from a report presented by a number of organizations to the Special Rapporteur in July 2012, as well as his own interviews. All Information in Tables 4 and 4.a is based on a report submitted by the Daftar Tahkim Vahdat student association to the Special Rapporteur in July 2012. Unless otherwise noted, all information in Tables 5 and 5a is drawn from a July 2012 report submitted to the Special Rapporteur by Reporters Without Borders. Information on the arrests of Mohammadi and Mohadess can be found at the website of the Beheshti Foundation (available at: http://www.beheshti.org/). According to the Masregh website (http:.//masreghnews.ir).